Should You use a Joint Tenancy With Right of Survivorship as an Estate Planning Tool? - The Hart Law Firm, P.A. Should You use a Joint Tenancy With Right of Survivorship as an Estate Planning Tool? A joint tenancy with right of survivorship is a way that several people can hold legal title to an asset such as a piece of property, a bank or investment account, or even a car. When two or more people own a bank account or piece of property as joint tenants with right of survivorship, each “co-owner” has equal rights and access to that property. 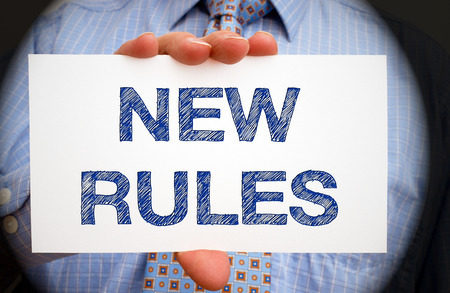 When one of the co-owners dies, the property passes immediately to the other co-owners without needing to go through probate. RELATED: Click here to read more about why updating beneficiary designations does NOT count as estate planning. The only accounts that you cannot hold as a joint tenant with right of survivorship is a tax-deferred retirement account such as an IRA, a 401(k), a pension, or an annuity. When you hold a property as a joint tenant with right of survivorship (or JTWROS), both you and the other joint tenant own the property. This can be a source of confusion for some people who title assets (particularly bank accounts) in this way so that a loved one can help them manage their finances, pay their bills, etc. What Does it Mean to Hold Title as a Joint Tenant with Right of Survivorship? 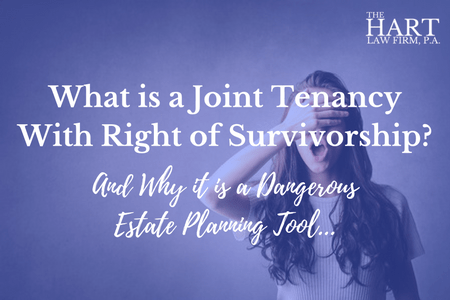 Before I get into the problems that can arise if someone uses a joint tenancy WROS without fully understanding the legal implications of doing so, let’s talk about what it means, legally speaking to hold a joint tenancy with right of survivorship with another person. When someone owns property or a bank account as a joint tenant with right of survivorship, each co-owner has an unrestricted right of access to that property or account. In other words, if a parent adds a child to their bank account as co-owner so that they can help with the bills, that child now has the right to take all of the money from that account if they choose. (Not likely I realize, but you get the idea). Similarly, if your adult child has to go through a divorce, or gets sued for some reason, then this bank account becomes available as an asset to divide with the child’s spouse or satisfy a judgment against that adult child. As you can see, from a pure asset protection perspective, a joint tenancy may not be the best option for many people. In the case of real estate, both co-owners would have the right to access to the property, or even mortgage the property (although both joint tenants may need to sign off on a mortgage depending on the laws of your state). Many people prefer to use a joint tenancy with right of survivorship as an estate planning tool. The thinking is that when one of the joint tenants dies, the property will pass outside of probate to the other joint tenant. There can be several problems with this strategy. First, this is a dangerous strategy in that it could put your assets at risk. As referenced above, by adding an adult child or another person as a joint tenant to a bank account or piece of real estate, you are putting that asset at risk in the event of divorce, bankruptcy, or lawsuit on the part of the person you name as co-owner. Second, it is important to consider the joint tenancy in lieu of your entire estate plan. Frequently, a parent may have three children, but only add one child to their bank account. 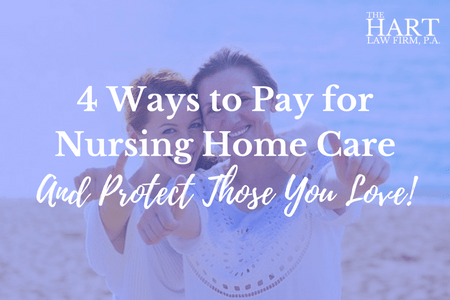 They do so because they need that child to help them pay their bills (something a trust or general power of attorney could easily accomplish with a lot less risk). When the parent passes away, the child named on the account inherits the entire balance of the bank account, leaving the other two siblings with nothing. This may or may not be what the parent intended, and can lead to friction and confusion between heirs. Finally, it is important to understand that using a joint tenancy, especially with a married couple, doesn’t completely avoid probate – it just delays it until the second co-owner dies. Additional questions about Joint Tenancy with Right of Survivorship? At The Hart Law Firm, we do so much more than drafting documents. We work with families to protect everything they have spent a lifetime to build. If you would like to sit down with us for a quick “meet and greet” to learn more about how we may be able to help you protect you and your family, feel free to call our office at (919) 883-4861 or click here to contact us.